I’ve always been slightly suspicious of the concept of including vegetables in desserts and cakes. Carrots I can understand. They’re slightly sweet and of course there’s carrot cake which we know and love (well, I do; I can hear the Perky Kebab’s shouts of horror at that statement). Pumpkin pie is another one I totally get – mild and slightly sweet when baked, pumpkin makes a great addition. But courgettes in cakes? Not something I’ve ever been able to get that enthusiastic about. Don’t get me wrong, I love a good old courgette. Courgette fritters, pasta sauces, chargrilled in a salad with feta. All absolutely delicious. But there’s something about the flavour of a courgette I just couldn’t imagine in a cake. Anyway, I digress. The recipe that really grabbed me was the recipe by Harry Eastwood for Chocolate and Courgette cake. It looked squidgy and delicious, the sponge made using ground pistachios and rice flour, making it gluten free. Plus, shock horror, the sponge contained no butter or oil. A healthy cake I thought! How could I not give it a try? 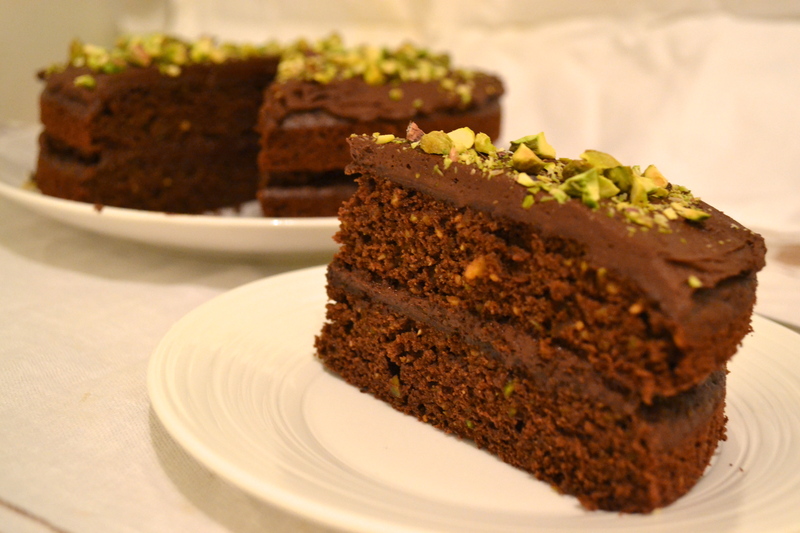 So to the kitchen I went, courgette in hand to recreate this “healthy cake”. And what a result! You would never know a courgette had graced the mixing bowl. 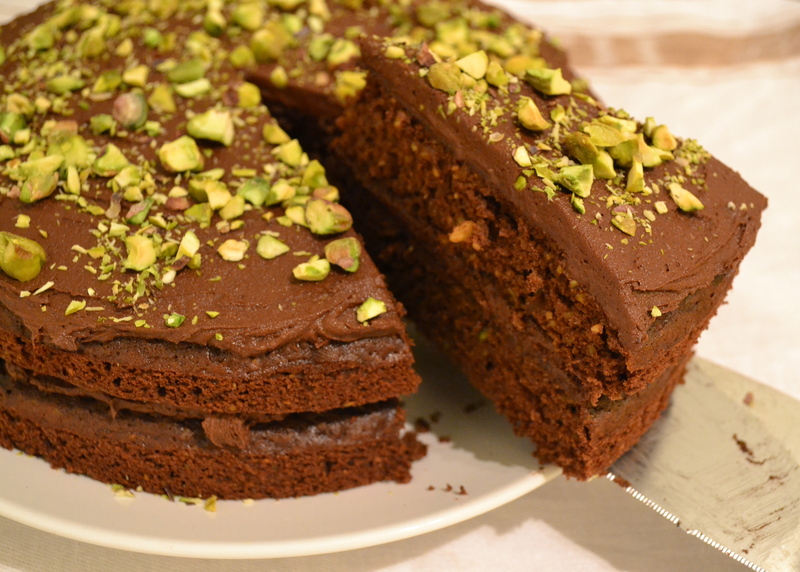 The sponge is fudgy and moist, and you get a lovely hint of pistachio from the sponge and icing. Unfortunately the healthy claims have to end at the icing (unsurprisingly full of butter and sugar). But at the end of the day it is a cake and should be naughty, and there aren’t may times you can say you’ve had one of your five a day after eating a chocolate cake! 1. Preheat the oven to 180ºc/160ºc fan. Line and grease two 18cm sandwich tins. 2. 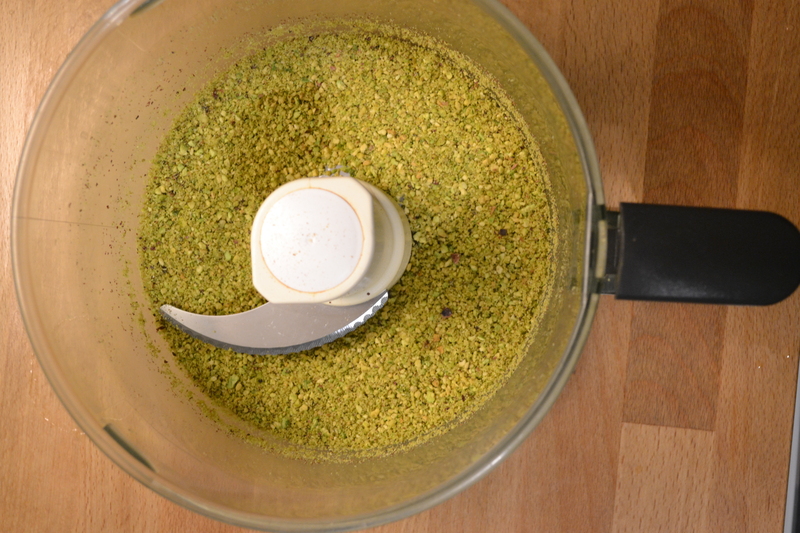 Blitz the pistachios for the cake in a food processor until they resemble powder. If they clog together too much use a tablespoon of flour to help loosen them – they need to be as fine as possible to give the cake a good texture. 3. 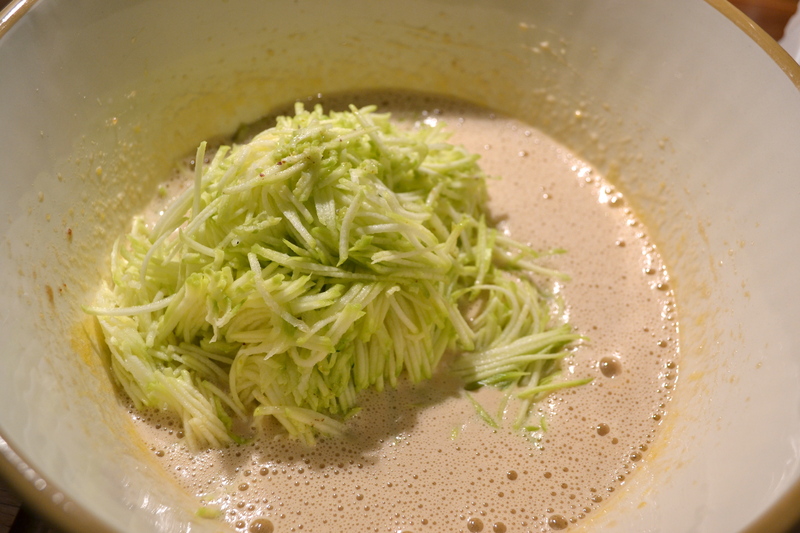 Whisk the eggs and sugar together in a bowl until pale and fluffy (about 2 minutes). Beat in the courgette and pistachios, then the rice flour, cocoa powder, baking powder and salt. Beat again to ensure everything is well combined. 3. Split between the 2 cake tins, even off the tops and bake in the middle of the oven on the same shelf for 30 minutes (if you can stick a toothpick in and it comes out clean, the cake is done). 4. When the cakes are done, leave in their tins for about 5 minutes, then carefully turn out onto a wire rack to cool, removing the baking parchment from their bases. 5. 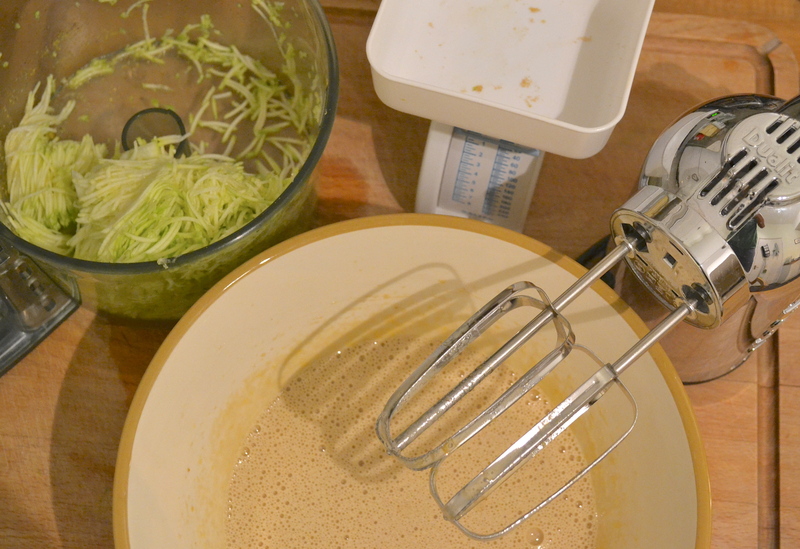 For the icing, beat the butter in a large mixing bowl with an electric whisk until pale and softened. Add the icing sugar and 2 tablespoons of boiling water and beat again until it forms a paste. Beat for one more minute at high speed until the mix has doubled in volume. 6. Beat in the cocoa powder 1 tablespoon at a time, mixing well after each addition. After all the cocoa powder has been added, beat for a final minute to ensure everything is combined and the mix is full of air. 7. 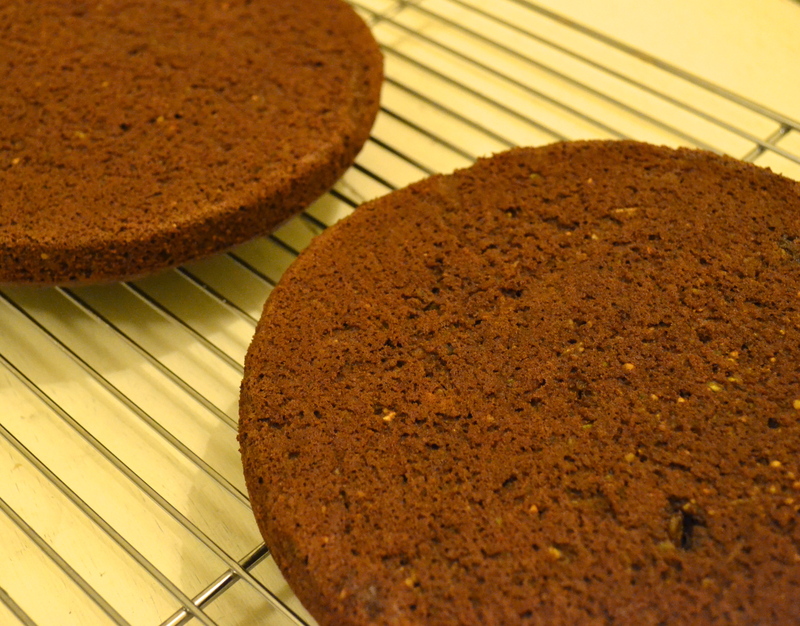 Once the cakes are completely cool, ice the underside of the cakes using half of the icing. Sprinkle one with whole pistachios (I omitted this step), then sandwich together and ice the top. Sprinkle the top with the chopped pistachios. 8. Keep the cake in the fridge, taking out 20 minutes before serving. I’ve baked this cake twice. I love it. It not heavy despite the delicious but not healthy filling! My friends were doubtful and it convinced them we can have courgettes in a cake and it’s good! It is good isn’t it! Glad to have someone independent confirm it as I think my husband is still unconvinced! !